This post has been update by Marotta’s 2013 Gone-Fishing Portfolio. A gone-fishing portfolio has a limited number of investments with a balanced asset allocation that should do well with dampened volatility. Its primary appeal is simplicity. As a secondary virtue, it avoids the worst mistakes of the financial services industry. This year I limited myself to 12 investment vehicles. Asset allocation begins by selecting the top six asset categories. A good starting point is an age-appropriate allocation. We use as our example a couple both born in 1972 and turning 40 this year. The most popular names of that era were Michael and Jennifer. Their age-appropriate allocation will be 3% short money, 5.8% U.S. bonds, 5.8% foreign bonds, 32.2% U.S. stocks, 36.2% foreign stocks and 17.0% hard asset stocks. Short money matures in less than two years. Often simply kept in the money market, it can be tapped for emergencies during the accumulation phase or used as a pool for spending during the distribution phase. Michael and Jennifer will put 3% in short money. Last year I chose a single exchange-traded fund (ETF) representing the entire bond market. This year I suggest two holdings as the best prospects for U.S. bonds and foreign bonds, respectively. PIMCO Total Return (PTTDX/PTTRX) looks for yield wherever it may be on the yield curve. 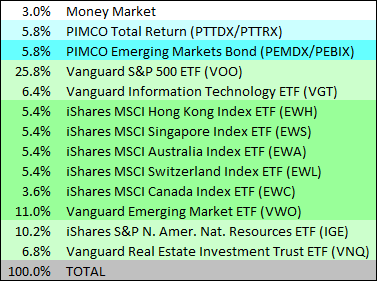 PIMCO Emerging Markets Bond (PEMDX/PEBIX) has a 4.72% yield. Michael and Jennifer will invest 5.8% in each. In the next few columns, I will explain why these two bond funds are appropriate choices for each category and why I chose mutual funds this year instead of ETFs. U.S. debt and deficit is enormous. We sit squarely in what investment author Bill Gross calls the ring of fire. We are also burdening businesses with needless regulation and steep tax increases that will continue to stunt economic growth. On the brighter side, the United States is still mostly free according to the Heritage Foundation’s Index of Economic Freedom. For these reasons, we recommend investing more in foreign stocks in countries with less debt and deficit than the United States but still investing here. We normally suggest tilting small and value to boost returns. But this year the projected price-to-earning ratios favor a large blend. Therefore we advise mostly investing according to the S&P 500. We recommend splitting your U.S. stock allocation 80% in the Vanguard S&P 500 ETF (VOO) and 20% in the Vanguard Information Technology ETF (VGT). For Michael and Jennifer that would mean 25.8% in VOO and 6.4% in VGT. The United States shines when it comes to technology, less burdened under government regulation than financials, energy or now health care. Although it has high volatility, technology also has historically high returns. About 20% of the S&P 500 is already in information technology, so our allocation will put 36.2% of your U.S. stock holdings there. For Michael and Jennifer, 2.3% of their total portfolio will be in Apple stock, the highest concentration in their portfolio. I would use half of the 12 investment options in foreign stocks. Tilting foreign and toward very specific countries may be the best investment advice for 2012. Avoiding countries low in economic freedom and high in debt and deficit may be critical to experience good investment returns. Last year I included options for ETFs that represented the MSCI EAFE Index of developed countries before recommending specific countries. The EAFE index stands for Europe, Australia and the Far East. Australia is positive, but the Far East is mostly Japan, a country with the highest ratio of debt to gross domestic product. Most of Europe is also firmly in the ring of fire with high debts and deficits. For every dollar invested in the EAFE index, 61 cents is allocated in these countries. Therefore I recommend investing only in specific developed countries. First I would put 15% of your foreign stocks in these countries high in economic freedom and low in debt and deficit: Hong Kong (EWH), Singapore (EWS), Australia (EWA) and Switzerland (EWL). I would allocate another 10% in Canada (EWC), lower than the others because of its rising debt. These are all ETFs by fund company iShares. These five countries have the top rankings in the 2012 Heritage Foundation’s Index of economic freedom. They all have low debt and deficit. All five countries have better financial investments than the United States. Australia and Canada have better investments for materials. Canada has better energy investments. Switzerland has better consumer staples and health care investments. These countries are the best places where your investments will be free to grow unhindered by the drag of big government. Finally, I would allocate the last 30% of our couple’s foreign stock allocation to Vanguard emerging markets (VWO). Unlike America and Great Britain’s century of invention and innovation, emerging countries today can develop quickly. All Brazil has to do is to send their children to one of our schools for four years. After returning home, they can buy parts for a factory on the global market and be ready to compete with us in a matter of months. All they need is the capital to get started. That’s exactly what your investment provides. Michael and Jennifer would invest 5.4% in EWH, EWS, EWA and EWL. They would invest 3.6% in EWC and 11.0% in VWO, emerging markets that can be extremely volatile but also very profitable. The last asset class, hard asset stocks, includes companies that own and produce an underlying natural resource. Examples include oil, natural gas, precious metals (particularly gold and silver); base metals such as copper and nickel; real estate investment trusts (REITs); and other resources such as diamonds, coal and lumber. Do not equate investing in hard asset stocks with investing directly in commodities. Buying gold bullion or a gold futures contract is a direct investment in raw commodities or their volatility. Buying a gold mining company, in contrast, is a hard asset stock investment. For 60% of your hard asset allocation, we recommend the iShares S&P North American Natural Resources Index ETF (IGE). This index tracks hard asset stocks in North America. It consists of 62% energy and 15% metals and mining. The largest holding in this fund is Exxon Mobil (XOM), the second largest holding in the S&P 500. Given these two ETFs, Michael and Jennifer will have 1.6% of their investments in XOM. For the other 40% of your hard asset allocation, we recommend the Vanguard Real Estate Investment Trust ETF (VNQ). This fund invests in all aspects of the U.S. real estate market from commercial to residential. REITs are a very small percentage of IGE or the S&P 500. A specific allocation to this sector provides an additional diversified hedge against inflation. Michael and Jennifer will put 10.2% in IGE and 6.8% in VNQ. These two investments provide an additional allocation to U.S. stocks, tilting the entire portfolio back toward domestic investments. The total tilt will end up 55% U.S. stocks and 45% foreign stocks. Michael and Jennifer’s average gross expense ratio would be only 0.31%. An age and portfolio value calculator can be found on our website at: http://www.marottaonmoney.com/gone-fishing-2012/. 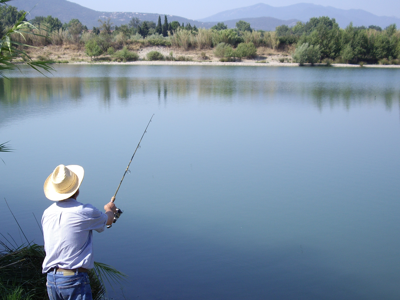 A gone-fishing portfolio is appropriate for limited amounts of money, especially during the accumulation phase. When investors have significant holdings or approach retirement, I recommend seeking professional comprehensive financial planning from a fee-only fiduciary. To find a NAPFA advisor in your area, visit www.napfa.org or call 1-800-366-2732. Great articles, but as a new investor it leaves me unsure what to do. Last year my wife and I invested across all 10 categories in your 2011 Gone-Fishing Portfolio (since it was our first time we had a larger amount saved). Our portfolio is only slightly out of balance (within 1%) between US/Foreign/Hard Assets. This year we want to invest again, but this time have smaller amounts to invest with. What do you do when you are planning on making only 4-6 investments a year. Since the best investments change year to year it doesn’t seem like we should simply follow the 2012 investment strategy over a 2-3 year period. But that leaves what to choose this year unclear. Is the important thing to stay balanced across the different asset classes even when you can’t make enough investments to diversify within the classes? It just feels like we’re going to end up buying something different each year! Is that bad? Knowing how to practically rebalance our portfolio is also something that I’m confused on. How far out of balance warrants rebalancing? Could a future article give a nuts and bolts example for the new investor? Thanks for all your help and great articles! Each year I try to make the best gone-fishing portfolio I can for those just starting to invest. The most important part of the asset allocation is the top level six asset categories. Staying relatively balanced at this level is the most important part of asset allocation. This year’s changes were meant to highlight some of the important trends. Dynamic asset allocation suggests tilting away from small value. And this may be one of the times to avoid Europe and Japan and other countries with high debt and deficit and low economic freedom. David, How would you compare the group of three separate iShares (EWH, EWS and EWA) with the alterative of just the one Pacific ex-Japan (EPP)? On the surface, it seems that they might be similar, but there must have been something that drove you into the separate iShares? Using the three individual countries allows you to balance the mix between all three more evenly. I was wondering if you have a 2013 version of your gone fishing portfolio. I have small portfolio made up of stocks and I would like to re-balance and re-allocate everything properly. Thanks.